Firmware Manager Tool is a small application for windows computer which allows you to restore firmware on your iOS devices. It is mainly created for iDevices. In order to restore the firmware, you need to locate the IPSW file from your computer. It allows you to get your job done in few seconds only with its simple user interface. 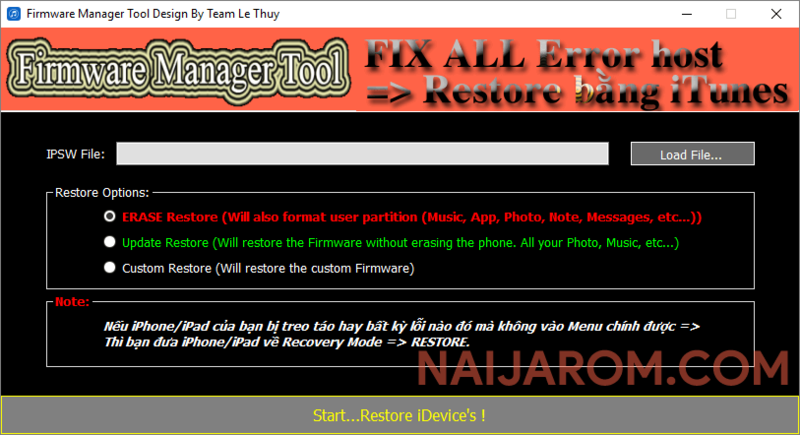 Firmware Manager Tool comes with 3 options to restore: First, You can Erase Restore. It will also format user partition. It means, choosing this option may delete your Music, Apps, Photos, Notes, Messages and others. Second option allows you to restore firmware without erasing any data from the phone and the third option allows you to restore custom firmware. This Firmware Manager Tool is an open source tool hence you may use it free for always. In order to use the Firmware Manager properly, you need to install the Universal ADB Driver on your Computer. Once Driver is installed you can successfully connect your iOS Device to the computer, and launch the Firmware Manager on the computer. [*] Credits: Firmware Manager Tool is created and distributed by Team Le Thuy (developer). So, full credits goes to Team Le Thuy (developer) for sharing the tool for free.